The long-awaited $2.4 billion extension that is set to connect Manhattan’s far west side and Hudson Yards development with the No. 7 line will finally open in September, MTA officials say. The opening of a station at 34th Street and 11th Avenue is now expected to open on Sept. 13, according to the MTA. The station's opening has been delayed several times in the past few years and had most recently been slated to open by June. A series of unforeseen delays, including the inability to get funicular escalators, which would ferry straphangers between the surface and the platform 11 stories below ground, pushed back the opening. 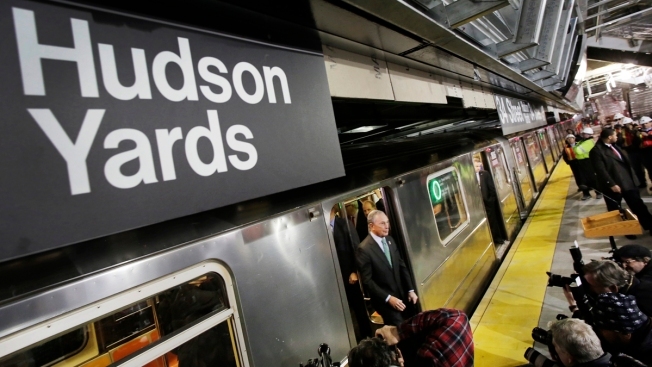 The September opening would come nearly two years after then-Mayor Michael Bloomberg took a ceremonial first ride to the new station from Times Square, calling the one-stop extension "something we should all be proud of." Work on the line began in 2007. Originally, Bloomberg had hoped that the subway would lead to a sports stadium that would host the 2012 summer Olympics. That arena was never built and the games were awarded to London, but the mayor's fallback vision for the site, dubbed Hudson Yards, is taking shape now. About 14 million square feet of office buildings, apartment towers and hotels are planned or under construction in an area once dominated by a rail yard, blocks of industrial buildings and an isolated convention center. Close to 9,000 apartments are expected to be built in the next five years. Officials said 40,000 to 50,000 people may ultimately work in the new buildings. The station will also sit near the northern terminus of the High Line, a former elevated rail line that is now a public park, and which has become a popular tourist destination.